The blockhead quilt has been finished and delivered. This was a present for my youngest grandson’s first birthday. He liked the bright colors and his older siblings enjoyed the subject matter. This is the second quilt from the this pattern. I like this quilt better than the first one for two main reasons – it is a rectangle and the border fabric is bolder. I wanted this quilt to have a casual feel so I did not miter the corners of the border. 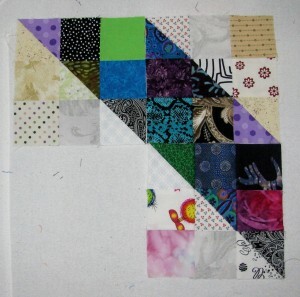 This is one of my favorite border treatments, especially for square quilts. Bonnie Hunter has issued a challenge for the 2013/2014 leader ender project of split-9 patches. Since my 2 1/2″ bin is overflowing, I accepted. I wonder how many of these I will have this time next year. Check out Design Wall Monday at Patchwork Times for more inspiration. 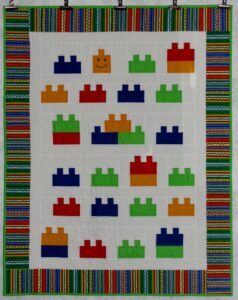 I love your baby quilt, where can I find the pattern? The pattern is called Blockhead Baby Quilt and it is free on the Moda Bake Shop Recipe website. My post from April 25, 2013 has a link directly to the pattern. As you will see, I made some changes to the pattern. I think you will enjoy making this quilt – I did.